It is the sixth summit meeting between Israel, Cyprus and Greece. U.S. Secretary of State Mike Pompeo, Cyprus President Nicos Anastasiades, Israeli Prime Minister Benjamin Netanyahu and Greek Prime Minister Alexis Tsipras. Credit: Amos Ben-Gershom/GPO. 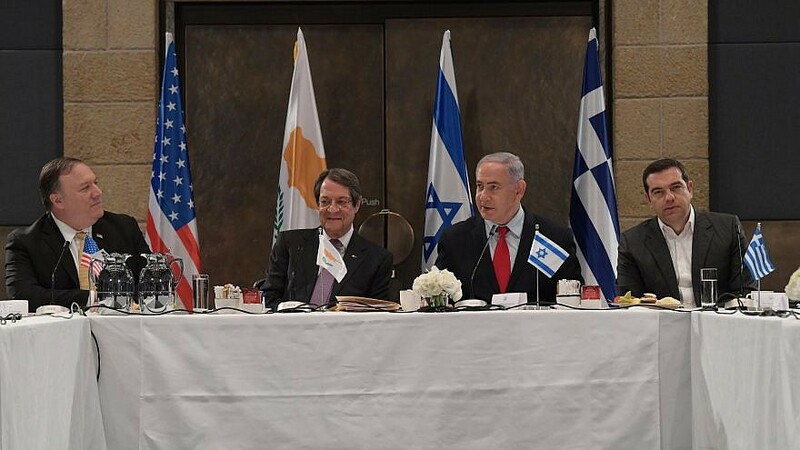 (March 20, 2019 / JNS) U.S. Secretary of State Mike Pompeo and Israeli Prime Minister Benjamin Netanyahu met with Cyprus President Nicos Anastasiades and Greek Prime Minister Alexis Tsipras at the David Citadel Hotel in Jerusalem on Wednesday to discuss cooperation between the countries, including the upcoming East-Med pipeline connecting Israel and the European Union. “This is the sixth summit meeting between Israel, Cyprus and Greece. We began this a few years ago, and it’s blossomed into one of the best regional associations in the world,” said Netanyahu. Pompeo met one-on-one with Netanyahu earlier on Wednesday, when they focused on the Iranian threat.